For further textile processing into different types of fabrics, tapes, ropes, sleeves, etc. Yarn is a long continuous length of interlocked fibers, suitable for use in the production of textiles, sewing, crocheting, knitting, weaving, embroidery and rope making. The primary cakes are rewound by means of special equipment using a certain predetermined twist direction and number of twists per meter. 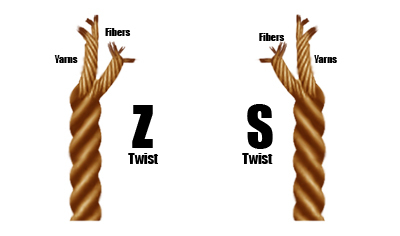 Yarns twisted in one direction are called single yarns, and those twisted to the right and left are called S-twist yarn and Z-twist yarn respectively. Several single yarns twisted together are called plied or balanced yarns. Single and plied yarns are used selectively according to purpose. S-twist and Z-twist yarns are the direction in which the yarn is spun is called twist. Yarns are characterized as S-twist or Z-twist according to the direction of spinning. Tightness of twist is measured in TPI (twists per inch or turns per inch). In Europe more common measurement is number of twists per 1 meter.